We can either give you a pool opening guide with all of the steps needed to open a pool or we can come out and do it for you. It can be a complex procedure but we have a checklist we follow to make sure it it is done properly. At the end of the season it is critical that your pool be closed properly. If it is not done correctly major damage can occur over the winter to the pipes, the pump, the coping, the gunite, and the liners. While you can try to close your pool yourself, it can be risky if you don’t do it properly. We follow a pool closing checklist when we close pools so nothing gets missed. We come out on a period basis to test your pool water. The results of the test indicate what chemicals are needed and in what amounts. We can apply the chemicals for you or give you a pool maintenance schedule to administer the chemicals yourself throughout the season. Sometimes pipes break. Sometime pumps stop working. Sometimes the pool filter gets damaged. Sometimes the grout comes off. 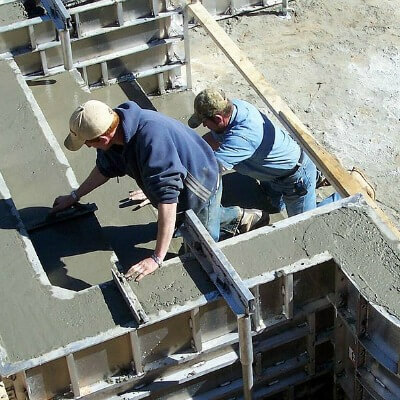 Sometimes the coping and the gunite get damaged. Sometimes the liners get damaged. We have the resources to fix all of these problems. 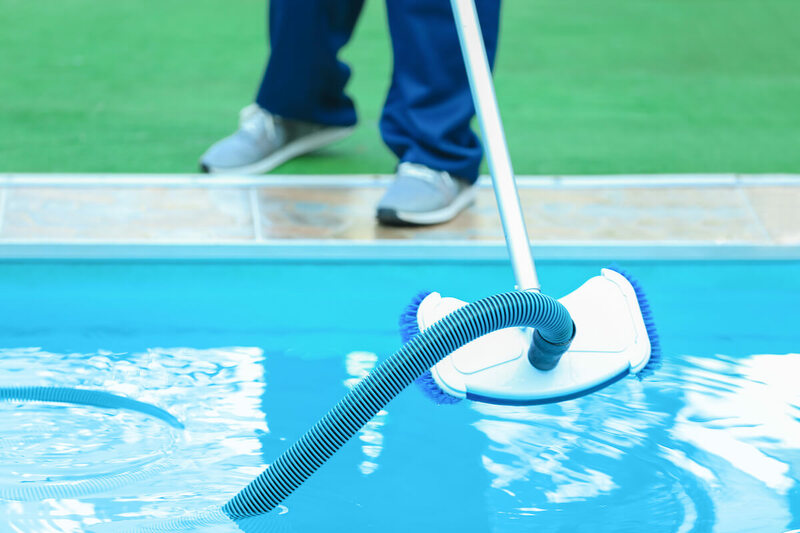 Our pool repairmen are highly trained, certified and insured. We fix problems the right way! If you need to renovate your pool, we can do it. We have catalogs for you to browse that will give you ideas on what you want your pool to look like. We will help you find what you want within your budget. We work with you from the beginning to the end of the project. We always finish on time and within the estimated quote. It is spring and you are all excited about using your pool this summer. You have pool parties planned and have set up a workout schedule with how many laps you will swim each day. But before all of that can happen, your pool needs to be prepared. You need to remove the cover, raise the water level, get your pump working and add the proper chemicals in the proper amounts. Opening a pool is not as complex as closing down a pool at the end of the summer but there are steps that need to be followed. We use a pool opening checklist to make sure we don’t miss any steps. We will prime your pump and get it working. We will check the filtration rate to make sure it is filtering properly. We will check the flow rate of the water. We will check your pool gutters, your skimmer baskets, all of the valves on your pump and filter. We will evaluate the pump capacity to make sure it is the right size for your pool. Most people just assume that the pump was specifically designed for their pool and they never have the capacity checked. We will chart what is called a pump performance curve. In most cases the capacity is fine but every now and then we find that the pump is too small for the size pool it services. If that happens, we will sit down with you and show you the options available. If you have a spa or hot tub connected to your pool, we will check your diverter valve to make sure it is working properly allowing you to change the direction of the water to the hot tub or switch it back to the pool. We will test your water and apply the necessary chemicals in the proper amounts. We will come back out a few days later to check and see if your water is clear. If it is not, we will test again and make the proper adjustments. We will not be finished until your water is crystal clear and you are satisfied. The summer is over. Now what? You will need to have your pool closed down and winterized. This job is not for the faint of heart! There is a certain procedure that must be followed. You must have all of the necessary pool closing equipment on hand. You must know how to blow out the lines, drop the water level to the proper level, winterize the pump, and cover the pool. It is very critical that the closing be done right. If anything is missed, something could freeze over the winter and cause major damage. We have seen pipes break and pumps damaged because not all of the water had been blown out properly. So when we close your pool we will adhere strictly to the pool closing checklist. We guarantee our work so that if there are any damages caused by the winter that could have been avoided with a proper closing, we will fix them at no cost to you. As we do when we come to open your pool, we come with a truck loaded with supplies and parts. We are prepared for all situations and take pride in the fact that we don’t have to run back and forth to the store to get the equipment we need. Before we put the cover on the pool we will inspect the pool gutter, the coping, the skimmer baskets to make sure they are not damaged. We will clean them, backwash the filter, blow out the pipe and make sure all the water in the pump has been removed. We will then cover the pool with your cover and leave you with a set of instructions on how to maintain your pool during the winter. Do you know how to operate the air relief valve at the top of the filter tank? It relieves the pressure inside the filter and removes the air. It is sometimes called the pressure relief valve. Do you know how to get rid of algae if it forms in your pool water? Do you know what algaecides to use and in what amount? Do you know how to clean the filter by backwashing? This reverses the flow of water through the filter to get rid of dirt. Do you know how to balance the pH, the calcium and the alkalinity in the pool water? If the pH is too low it can cause etched plaster, metal corrosion and eye irritation. A high pH can also cause eye irritation, scale formation and chlorine inefficiency. Do you know that you need to use bromide salt or bromine to disinfect your pool water and how much of it to apply? Do you have a chlorine neutralizer to make the chlorine in your pool harmless? It is used to destroy excessive amounts of chlorine or bromine so it will not affect the people in the pool. 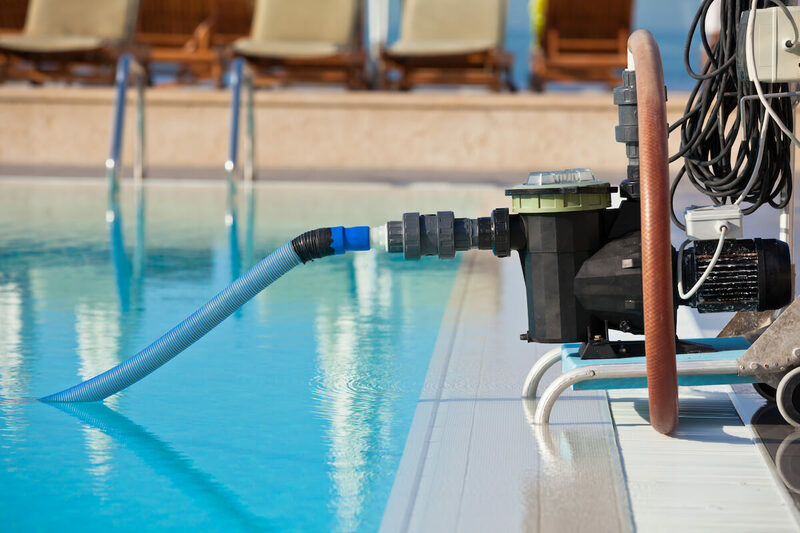 Do you know how to prevent corrosion of the pool equipment? These are just a few of the questions you need to know if you want to maintain your pool yourself. If you can’t answer these questions call us. We have a pool water testing kit to help us determine the proper chemicals that are needed for your pool and in what amounts. We don’t go by our “gut feel”, we test. Everyone’s pool is different. 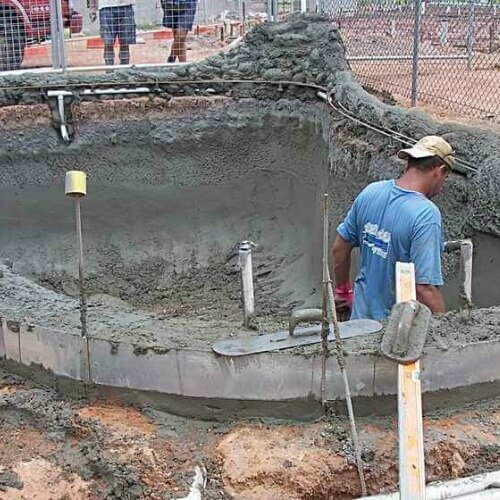 Some are gunite (concrete) pools. Some have vinyl liners. Some are fiberglass. Some use diatomaceous earth in their filters. Some are near wooded areas. Some are in open areas. Some are inground pools. Some are above ground pools. Some people use their pool on a daily basis and some use it on the weekends only. There are so many factors that determine what chemical mixes should be used for your pool. 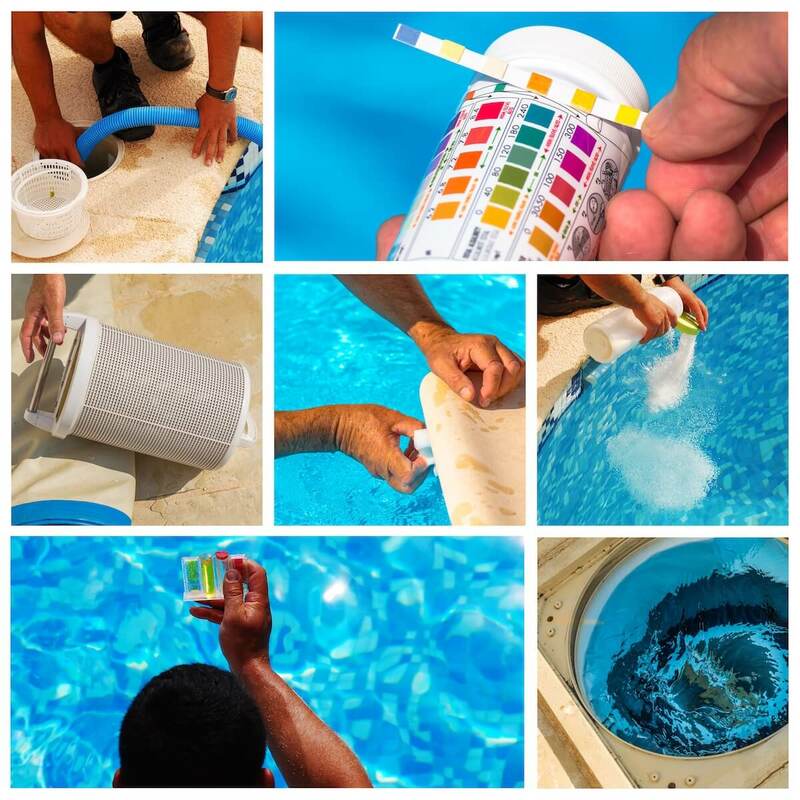 We can show you how to use test strips to check the chemical balance of your pool water. You will want to test the water on a continuing basis and catch problems before they occur. Once we have calculated what chemicals your pool needs, we can come out and apply the chemicals on a periodic basis. Or we can set up a schedule for you to follow to help you apply the chemicals yourself. Another option is for you to purchase a chemical feeder. This cool device dispenses the chemicals into your pool at a predetermined rate. Use your test strips often. Sometimes after a storm the chemical balance in your pool water can change causing turbidity. This is a condition that causes extremely small particles to cloud up the water. They are too small to be trapped by the filter so we add a clarifier in the form of an organic polymer to coagulate the particles. This allows the filter to clean up the turbidity. Call us immediately if you see that your water is cloudy. Sometimes after many people have been using the pool, you will want to do a pool shock treatment. This is where you will apply a significant amount of oxidizing chemicals such as chlorine oxidizers, sodium persulfate or potassium peroxymonosulfate to get rid of the ammonia and nitrogen caused by your guests. This sometimes needs to be done because of inclement weather. We can do this for you or you can follow the pool maintenance guide that we can leave with you. You will need to apply sanitizers to protect the water from the sun, kill bacteria, algae and other living organisms. Again, we can do this for you or show you how to apply the proper chemical compounds. What do you do if your centrifugal pump stops working? What if your skimmer and skimmer baskets are not working properly? What if the baskets are damaged. What if the filter is not keeping your pool crystal clear? What if you have a gunite pool and the floor has become rough? What if the coping is damaged? What if the pressure on your pump has dropped to an inefficient level? What if you have broken pipes? What you have a vinyl liner and it has cracked? There are many things that can go wrong or get damaged in a pool. We specialize in being able to fix these problems. There are no problems that are too small or too big that we can’t fix. If you have any repairs that need to be made call us for a free estimate. We will do a diagnostic test on all of your equipment and determine the source of the problems if there are any. We will sit down with you and discuss your options, the cost and the time it will take to complete the repairs. Our technicians are trained, certified and insured and can do the work properly and in a timely manner. Do you want a heater for your pool? Do you want to upgrade your pool cover to a solar cover? Do you want to change the color of your pool? Do you want to add a slide, a basketball goal, an umbrella or some other pool accessories? We have catalogs for you to look at and we have people at the office that can provide advice and suggestions. We are always mindful of your budget and will only suggest things that are within it. We have provided many of our customers with complete renovations to their pools. It is like getting a brand new pool. We highly recommend you view our catalogs to see what we can do to your pool. Our work is top quality. The materials we use are top quality. We take no short cuts. We have a number of customers that will be happy to talk with you about the renovations we did for them. There is no greater joy for us than to see a happy customer!